Come Meet New Mexico’s Authors at our 12th Annual Authors for Literacy Event. 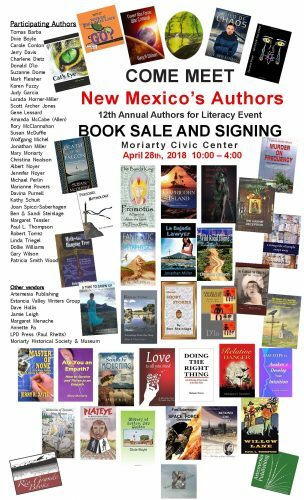 Local Authors will be selling and signing their books at the Moriarty Civic Center, April 28th, 2018 from 10:00 am-4:00 pm. We have over 30 Authors and Vendors attending. Come support local Authors, sponsored by the Moriarty Community Library and the Read “Write” Adult Literacy Program.